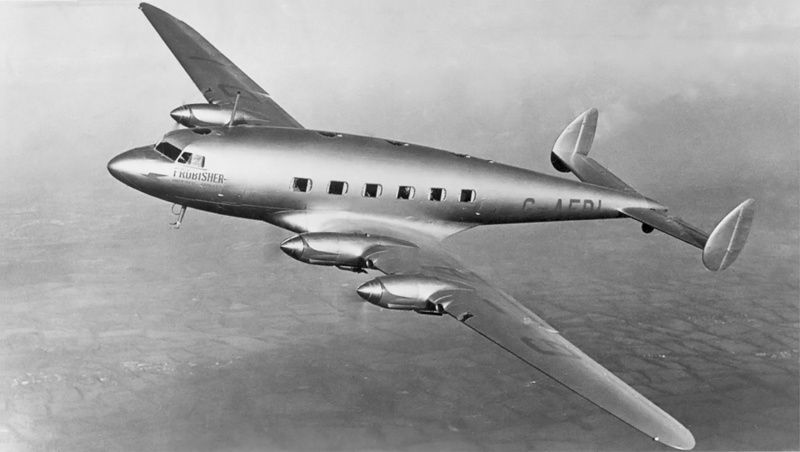 In the mid-1930s, the de Havilland Aircraft Company (de Havilland ) sought financial support from the British Air Ministry to develop a new transport aircraft. 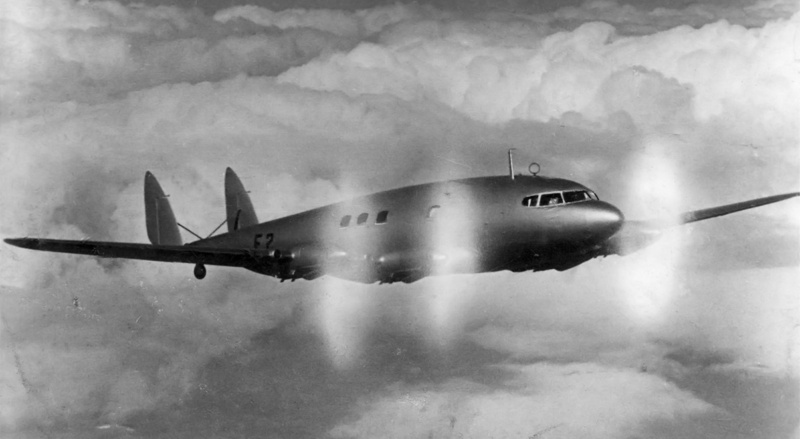 De Havilland felt that Britain was not developing transport aircraft of the same performance level as those from the United States. On 21 January 1936, the Air Ministry ordered two of the new de Havilland transports as transatlantic mailplanes under Specification 36/35. Five additional aircraft were ordered by Imperial Airways Ltd. and would be completed as passenger transports. The mailplane and airliner versions had only minor differences, and both aircraft were designated DH.91 Albatross. The flagship of Imperial Airways F class: the de Havilland DH.91 Albatross ‘Frobisher.’ Its clean lines can be seen in the image above. Designed by Arthur E. Hagg, the Albatross was an exceptionally clean, four-engine monoplane constructed almost entirely of wood. The long, circular fuselage had a steady taper toward the tail and was made of balsa wood sandwiched between thin layers of either cedar or birch, depending on location. The wood layers were cemented together and formed under pressure. Cabin construction allowed for pressurization, but such a system was never designed for the aircraft. The wing of the Albatross was constructed as one piece from a spruce structure covered with two layers of diagonal spruce planking. The thin wing was virtually sealed and would provide some level of buoyancy in the event of a water landing. The aircraft’s control surfaces were fabric-covered. The Albatross had twin tails. Originally, the vertical stabilizers were positioned near the fuselage, about a third of the way along the horizontal stabilizer. Due to control issues, the tails were redesigned and positioned at the ends of the horizontal stabilizer. The aircraft used a conventional taildragger landing gear arrangement. The main wheels retracted inward and were fully enclosed in the wing’s center section. The tailwheel did not retract. Four de Havilland Gipsy Twelve (King I) engines powered the Albatross. The Gipsy Twelve was an air-cooled, supercharged, inverted, V-12 engine. The engine had a 4.65 in (118 mm) bore, a 5.51 in (140 mm) stroke, and a total displacement of 1,121 cu in (18.4 L). The Gipsy Twelve produced 525 hp (391 kW) at 2,600 rpm for takeoff power, 425 hp (317 kW) at 2,400 rpm for maximum climbing power, and 320 hp (239 kW) at 2,200 rpm for maximum economical cruse power. Each engine was housed in a very tight-fitting, streamlined cowling. Cooling air was brought in via pressure-ducts in the wing’s leading edge. The ducts were located in the propeller’s slipstream on both sides of each engine nacelle. The cooling air flowed forward along the outer side of the cylinders, from the back of the engine to the front. The air was forced through the cylinders’ cooling fins and into the Vee of the engine, where an exit flap on the bottom of the cowling allowed the air to escape. The opening of the exit flap controlled the engine temperature. Each engine turned a two-blade, constant-speed, 10 ft 6 in (3.2 m) diameter de Havilland propeller via a .66 gear reduction. The basic structure of the mailplane and airliner versions of the Albatross were the same, but the aircraft did have their differences. The mailplane was designed to carry 1,000 lb (454 kg) of mail 2,500 mi (4,023 km) against a 40 mph (64 km/h) headwind, while the airliner was designed to carry 22 passengers and four crew 1,000 mi (1,609 km). The mailplane had four cabin windows on each side of its fuselage, compared to six for the airliner version. The mailplane utilized split flaps, while the airliner used slotted flaps. The mailplane Albatross had four 330 gal (1,250 L) fuel tanks mounted in the cabin, while the airliner had one 270 gal (1,022 L) and one 170 gal (644 L) fuel tank mounted under the cabin floor. The mailplane had two 9 gal (7.5 L) oil tanks per engine; the airliner had just one oil tank per engine. The cooling-air ducts in the wing’s leading edge can be seen in this view of ‘Frobisher.’ Each duct brought in air to the nearest cylinder bank. Note the landing gear wheel wells and the hinged cover on the main wheels. The Albatross had a wingspan of 105 ft (32.0 m) and was 71 ft 6 in (21.8 m) long. The mailplane had a top speed of 222 mph (357 km/h) at 8,700 ft (2,652 m) and a maximum economical cruse speed of 204 mph (328 km/h) at 11,000 ft (3,353 m). Its maximum range was 3,300 mi (5,311 km), and its gross weight was 32,500 lb (14,742 kg). The aircraft had a 550 fpm (2.8 m/s) climb rate and a ceiling of 15,100 ft (4,602 m). The airliner version had a top speed of 225 mph (362 km/h) at 8,700 ft (2,652 m) and a maximum economical cruse speed of 210 mph (378 km/h) at 11,000 ft (3,353 m). Its maximum range was 1,040 mi (1,634 km), and its gross weight was 29,500 lb (13,381 kg). The aircraft had a 710 fpm (3.6 m/s) climb rate and a ceiling of 17,900 ft (5,456 m). This view of ‘Frobisher’ shows the additional windows incorporated into the airliner version of the Albatross. The revised tail is also apparent. The Albatross mailplanes were built first, and the initial prototype flew for the first time on 20 May 1937. Robert John Waight was the pilot for the first flight. By October, the need to redesign the tails was evident, and the new tail fins were installed on the ends of the horizontal stabilizer. After the modification, the aircraft was registered as G-AEVV on 3 January 1938. On 31 March 1938, the Albatross suffered a belly landing due to a landing gear issue. Once repaired, G-AEVV became part of Imperial Airways in August 1939. All DH.91s were part of Imperial Airways F (Frobisher) class of aircraft and were given names starting with the letter “F.” G-AEVV was named Faraday. When Imperial Airways was merged with British Airways Ltd. in 1940 to form the British Overseas Airways Corporation (BOAC), the ownership of all DH.91s was eventually transferred to BOAC. Faraday was transferred to BOAC on 17 June 1940. On 1 September 1940, Faraday was impressed into service (as AX903) during World War II as a transport shuttle flying between Great Britain and Iceland. While landing at Reykjavik, Iceland on 11 August 1941, the aircraft collided with a Fairey Battle and was damaged beyond repair. Fortunately, the five people onboard the Albatross escaped unharmed. Some records claim the accident occurred on 11 August 1940, but this does not fit the timeline, especially since the date of impressment is recorded as 1 September 1940. The second mailplane was registered as G-AEVW and named Franklin. On 27 August 1938, the aircraft’s rear fuselage broke in two during overload landing tests, revealing a structural weakness. The aircraft was repaired, and the changes were incorporated into the other Albatross aircraft. G-AEVW was transferred to BOAC on 8 July 1940. Like Faraday, Franklin was impressed into service (as AX904) on 1 September 1940 and was damaged beyond repair in a landing accident at Reykjavik. The mishap occurred on 7 April 1942 when the aircraft’s landing gear collapsed. The four people onboard were not injured. The DH.91 was a very graceful and aerodynamic aircraft. Note the sleek engine installation and the cooling-air exit flaps under the engine nacelles. The first Albatross airliner was registered as G-AFDI and given the name Frobisher. 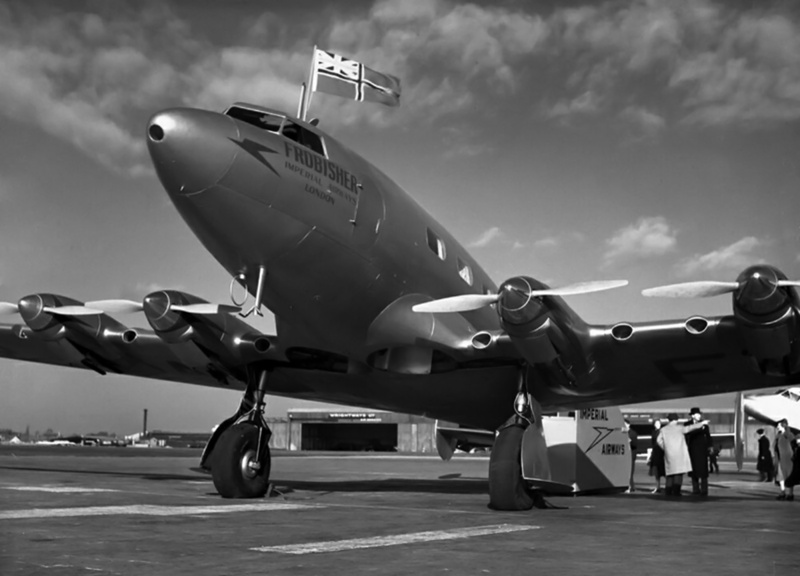 It was delivered in October 1938 and served as the flagship for Imperial Airways. The aircraft started experimental service in December and averaged 219 mph on its first service flight from Croydon, England to Cairo, Egypt. The aircraft was transferred to BOAC on 22 August 1940. Frobisher was destroyed during a German air raid at the Bristol (Whitchurch) Airport on 20 December 1940. The second airliner was registered as G-AFDJ and named Falcon. It was delivered to Imperial Airways in November 1938 and entered service in January 1939. The aircraft was transferred to BOAC on 27 August 1940. Falcon was scrapped in August 1943 after the loss of Fortuna (see below) and because the spare parts supply for the Albatross aircraft had been depleted. The third airliner was registered as G-AFDK and named Fortuna. 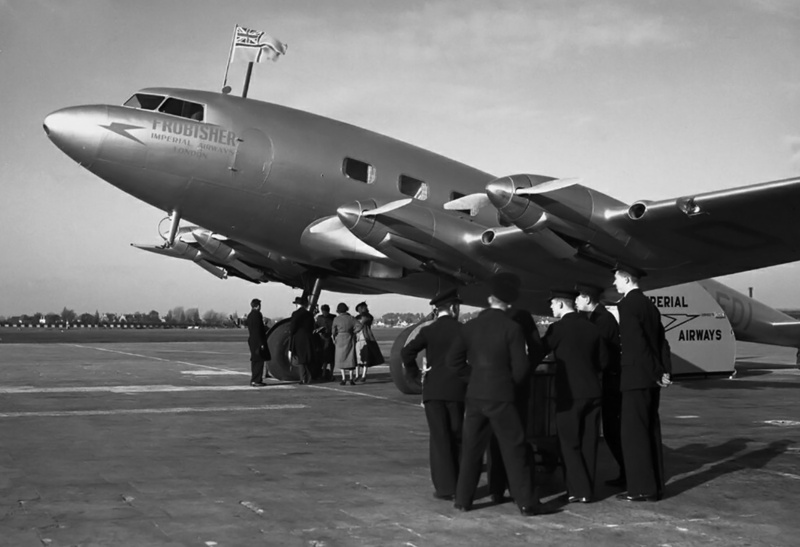 It was in service by mid-1939 and was transferred to BOAC on 27 August 1940. Fortuna crashed on approach to Shannon Airport in Ireland on 16 July 1943. The aircraft’s wing started to break up, and Fortuna crash landed short of the runway. All fourteen people on the aircraft survived the crash. This accident precipitated the last two surviving DH.91s, Falcon and Fiona (see below), to be removed from service. The two Albatross mailplanes served as transports during World War II, and both were lost in separate landing accidents at Reykjavik, Iceland. ‘Franklin,’ the second mailplane is seen above in its wartime camouflage. The fourth airliner was registered as G-AFDL and named Fingal. It entered service for Imperial Airways in 1939 and was transferred to BOAC on 29 August 1940. The aircraft was lost on 6 October 1940 while making an emergency landing near Pucklechurch, England because of a fractured fuel line. Fingal hit a farmhouse during the forced landing and was damaged beyond repair, but none of the three people onboard were injured. The last airliner was registered as G-AFDM and named Fiona. The aircraft entered service with Imperial Airways in 1939. 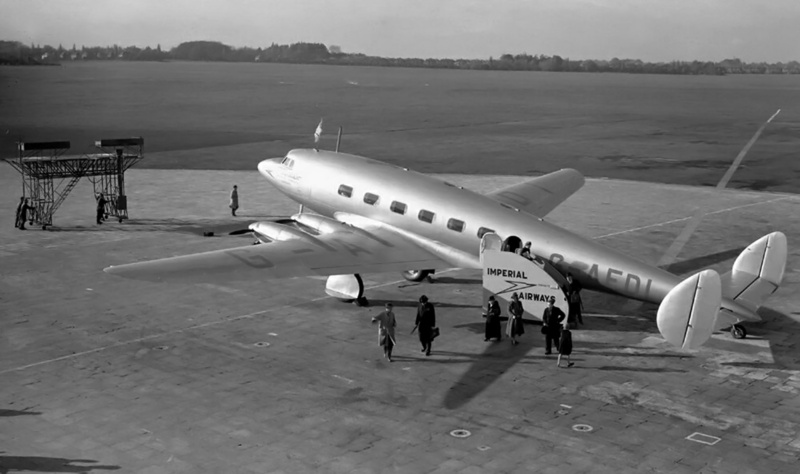 The aircraft was transferred to BOAC on 22 August 1940 and continued in service until being withdrawn after the Fortuna crash. Fiona was scrapped along with Falcon in August 1943. The de Havilland DH.91 Albatross was a beautiful aircraft that performed well in service. Part of its downfall can be attributed to its production right before World War II. It is rather remarkable to consider that four of the aircraft crashed during the landing phase of flight but that no one was killed in any of the accidents. While the Albatross cannot be considered a success, the techniques used in the Albatross’ wooden construction were applied directly to the incredibly successful World War II-era DH.98 Mosquito. Hagg went on to design the Napier-Heston Racer, and some of the Albatross’ streamlining traits can be seen in that aircraft. While landing in Shannon, Ireland, the wing of ‘Fortuna’ (seen above) began to break apart. The aircraft crashed short of the runway, but no lives were lost. Due to the crash and lack of spare parts, the two remaining DH.91s were withdrawn from service. Note the Bristol Beaufighter in the distance. This entry was posted in Aircraft, Between the Wars, World War II on 30 December 2015 by William Pearce. I agree with you – the DH.91 Albatross was a very graceful aircraft. In regard to their scrapping, I presume it would have been virtually impossible to rebuild the damaged wings and fuselage after an accident? At least with a spaceframe metal clad plane, you can rebuild the parts of the frame that are damaged, and screw back on body panels. I don't think this would be possible with an unitary wooden body. I think you are correct: virtually impossible but not completely impossible. On one hand, modern restorations have taught us that with enough dedication and money, anything can be repaired or rebuilt. But on the other hand, things were a little different in the middle of a war with the factories and shops producing war materiel as fast as they could. I think a “rebuild” of a heavily damaged Albatross would be more like a new build. These aircraft were the start of DeHavilind’s drive too put the high capital metal stress skin construction in its place.Unfortunately -They decided too do it with limed cottage cheese for the glue too hold everything together. I’ve come across accounts that have it that when Herman Goering was severely POed that thousands of Mosquito’s were coming out of dispersed piano factories and not constrained by aluminum stocks-why weren’t German aircraft factories doing the woodies? The response was very good designs-but not with the casein glue(of course),these planes were to be bonded in autoclaves with a film called Tegobond. Which of course was produced in only one giant Nazi owned factory. And hit the Tego film plant with explosives followed by incenderies-turning the whole thing into a ash layer. German aircraft production is said too have not recovered till 1944-and then production was mainly older dated types and not the superior wooden prototypes. So gorgeous! Possibly the most beautiful multiengine piston plane of all (cf. Amiot 370, Ki-77, Lockheed 049 and 1649, DH-104, etc.). And of course DH produced the best looking 4 engine jet of all in the Comet 1 or 3. But it is not clear to me that it was much of a step forward over the DC-3. Maybe an examination of payload vs fuel consumption would show something impressive. Of course, the wooden construction was a negative for an airliner. 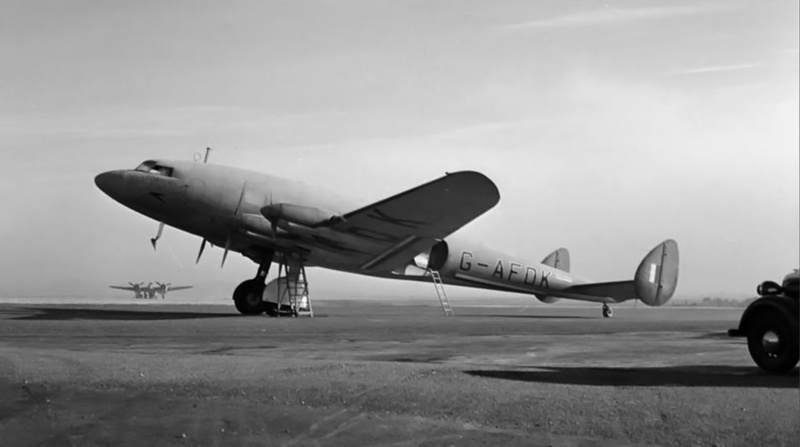 I agree that the DH.91 Albatross was not any real step forward over the DC-3, and its wooden structure was certainly a step back as far as the life of the aircraft is concerned. But, the DH.91 is certainly elegant and may have found more success if it was developed a few years earlier (like the DC-3).